Wolfgang Birkfellner holds a PhD in medical physics. 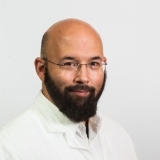 His scientific interest includes medical image processing, image - guided therapy, tracking hardware for medical applications, medical augmented reality, multimodal image registration, development and assessment of image-guided surgery software and control software for medical robotics. He is currently speaker of the Medical Imaging Cluster of the Medical University Vienna and Head of the Postgraduate Program "Medical Physics" - the official course for education of board certified medical physicists in Austria. According to Scopus, he is author co-author of 122 scientific publications, his current h-index is 31.